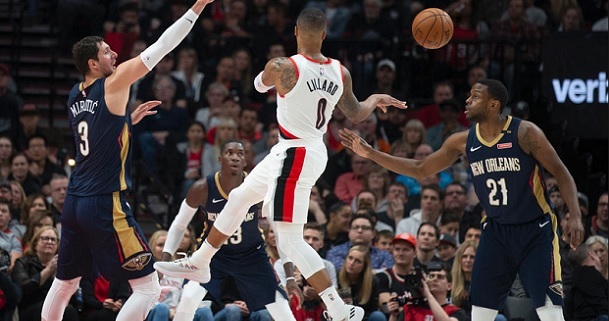 The Portland Trailblazers will attempt to claim some revenge when they host the New Orleans Pelicans, a team which surprisingly swept them in the playoffs last year. The Blazers (5-2, 2-1 home) are pretty much the same team which finished as a 3rd season in the West last season, and they are playing like it. Portland is having a good start despite a difficult schedule, having met 6 playoff caliber teams in the 7 matches they played. The hosts claimed two excellent wins in their last two games, beating the Indiana Pacers by 10 and the Houston Rockets by 19, both times on the road. The Pelicans (4-3, 1-2 away) started off the season strong, had a 4-0 record, but recently their form has dipped. The Pelicans did not play very well in their last 4 outings, barely stealing a home win against the lousy Nets and then losing 3 matches in a row. New Orleans will be on a back to back on the road here, after they lost in Golden State last night. Bet on Blazers vs. Pelicans and claim your 100% (120 Euro) freebet at LSbet now! Team news: The Blazers will continue to miss fringe players Harkless and Trent Jr. The Pelicans have Payton and Miller doubtful, but they will be happy to have Anthony Davis available, after he has been struggling a bit with a sore elbow. The Pelicans aren`t playing very well right now, and Anthony Davis returning after missing two games did not help them last night. Indeed, losing against the Warriors was normal, but Davis did not play well. Tonight, in the second game of the back to back, he might still not be at his best, and maybe even see some limitation in minutes. The Pelicans would definitely need him at 100% and dominating in order to realistically hope for a win here. The Blazers are red hot right now, they haven`t played in two days and will relish the opportunity to get one over the Pelicans, after being embarrassed in the playoffs last year. The Pelicans were utterly dominant in their shocking 4-0 sweep of Portland last season, and the matchup definitely seemed to trouble Portland, but much of that had to do with the defensive backcourt pairing of the Pelicans (Rondo – Holiday). Rondo is not on the team anymore and the Pelicans have the third worst defense in the NBA, allowing over 120 points per game (!!!). As such, Portland should not have the same problems scoring against them. Look for Portland’s superstar backcourt of Lillard and McCollum to be out for blood after being locked up by New Orleans a few months ago, and their intensity could be too much for a slightly tired Pelicans side to handle. Portland should have enough here to take care of a Pelicans team which has lost some form lately, and which is back to back on the road. My tip is Portland to win. Prediction: Portland Trailblazers – New Orleans Pelicans 122 – 114.